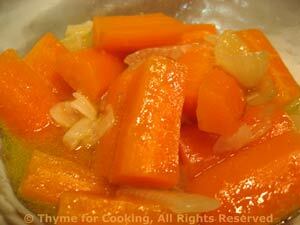 Carrots and Onions, Thyme for Cooking easy vegetable sides. Sautéed onions and chicken stock bring out the natural sweetness of carrots as well as making this common vegetable a bit more interesting. Cut onion 'half' in half again (vertically) and slice thickly - 1/4 inch (you will have 'quarter slices'). Heat oil in saucepan. Add onions and sauté until tender and starting to brown. Cook, covered, 15 - 20 minutes or until vegetables are done. Remove cover, drain and serve.